We've got another Jack Kirby Fourth World key issue that's very important to the character of Darkseid and the New Gods. New Gods #7 is breaking out of the sleeper zone and steaming up quick. Really quick. Rumors about Steppenwolf being a big bad in the upcoming Justice League movie has been circulating for quite some time now. Recently WB teased a deleted scene from Batman v Superman Dawn of Justice that had what appears to be Steppenwolf. This does confirm that WB definitely has Darkseid in it's plans for their newly shared cinematic universe. 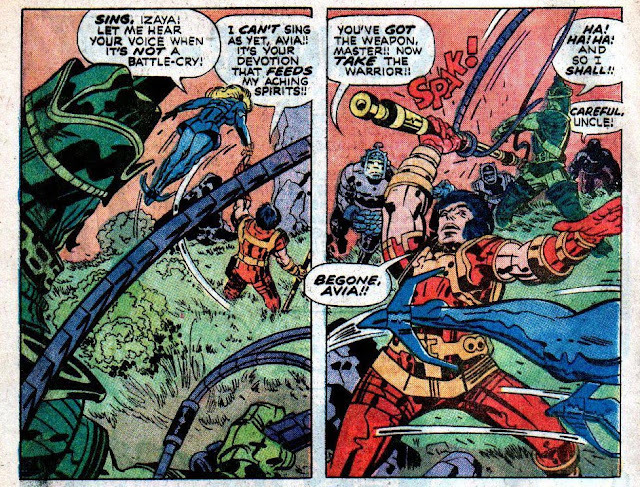 However, in the comics, Steppenwolf first showed debuted in The New Gods #7. Steppenwolf is the uncle and commander of Apokolips military forces under Darkseid himself. This debut depicts his role in what started the war between Apokolips and New Genesis. Steppenwolf is responsible for the murder of Highfather's wife and is depicted as doing so in this origin issue of the New Gods. That is him depicted on the cover as well. His intro panels are below. However, the key issue goodness does not end for this comic. There's a lot more going for it, and it should be considered a major Darkseid key issue without a doubt. The New Gods #7 also features the 1st appearances of Tigra and Heggra. These two characters are in direct relation to Darkseid. Heggra is Darkseid's mother and the sister of Steppenwolf. Here she is in her intro panel of this comic book and she is seated at the head of the table. Still the key issue goodness doesn't end there, though. This key issue also holds the origin of both Orion and Scott Free, also known as Mister Miracle. In the story called "The Pact", it reveals how the two worlds of Apokolips under the leadership of Darkseid and New Genesis under Highfather had been warring endlessly against each other. The story reveals how Darkseid and Highfather made a non-aggressive pact between the two worlds by exchanging sons. This key reveals that Orion is originally Darkseid's son and Mister Miracle is originally Highfather's son. 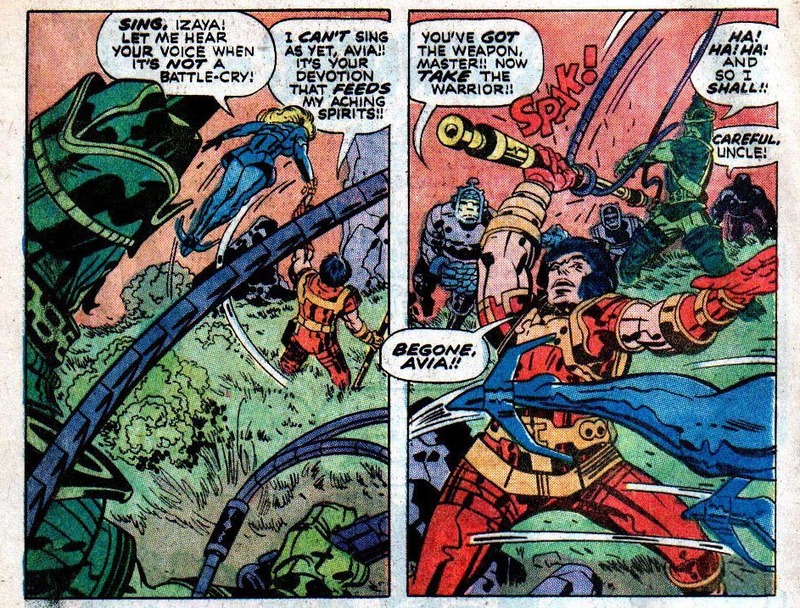 Tigra 1st shows up when she finds out that Darkseid has exchanged their soon as a tool for peace. She is obviously not too happy about it. Orion is but a boy in this issue, but Highfather adopts him. Orion accepts and the pact is made for the meantime. 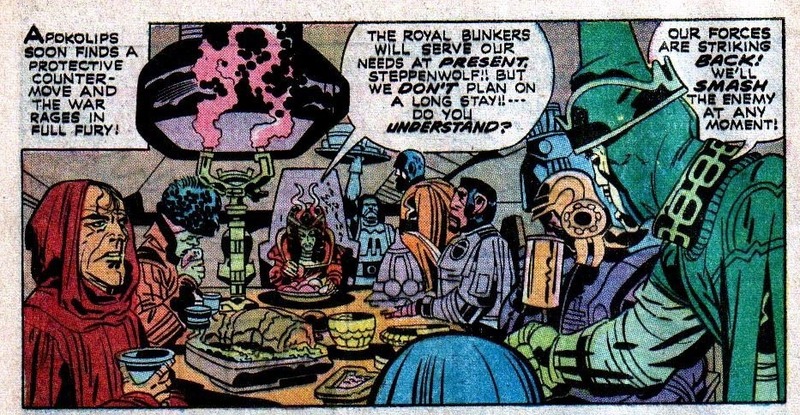 This issue is marked by Overstreet as an origin for the New Gods as a group and that's somewhat true. It definitely tells the backstory of Highfather, Darkseid, Orion, & Scott Free. Granny Goodness also makes an appearance in this issue as Darkseid has Scott Free (named by Granny Goodness) stay in her orphanage that's dedicated to raising loyal soldiers to Darkseid. 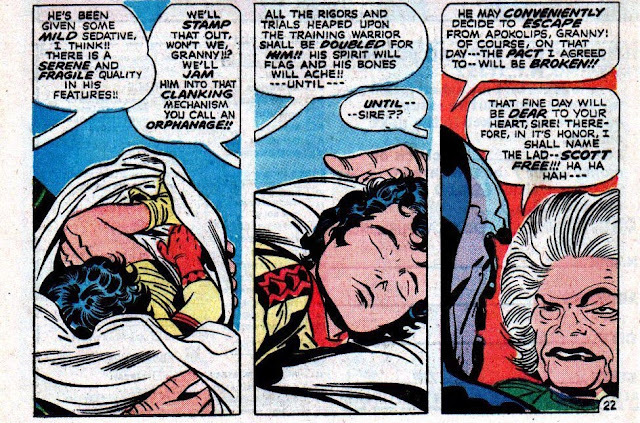 She promises that she will torture Scott Free so fiercely that he will escape Apokolips and break the pact. Since New Gods #7 has recently been discovered as an important Darkseid key issue with many 1sts and a origin for Orion, Mister Miracle, and the New Gods, there aren't many total copies in the CGC Census just yet. Right now there's a total of 70, and there are only four 9.8s. Expect that number to go up in the next few years for sure, and that includes the nineteen registered 9.6s in the census as well. So far there haven't been any recent sales of New Gods #7 in the CGC 9.8 range that could be found. I expect the value to reach New Gods #2 (2nd full appearance of Darkseid) pretty soon though, and that's around the $700 mark. Right now raw copies in the VF range are going for $80 bucks. Raw NM minus 9.2s are selling in the $140 range. The highest recorded sale of this key issue was a CGC 9.6 NM+ that sold for $262.90 at Heritage Auctions back in 2008. There's only been two graded sales on eBay so far. The 9.0 was sold in May of last year and the 8.0 was sold way back in 2012. This sucker is definitely on the move. I expect more copies to start getting submitted for grading on a larger scale in the near future. 'Till then we'll have to see how graded copies of New Gods #7 fairs in the secondary market and quite soon. If you missed the piece about the 1st cameo appearance of Darkseid in Superman's Pal Jimmy Olsen #134 just click the blue link to read about that. Other than that, New Gods #7 is a speculation comic to be on the lookout for, and one of the graded key comics of 2016 to definitely keep an eye on.